Donald F. Collins of Caribou, father of Maine's most popular politician and a fixture of Maine's political scene in his own right, has died. He was 92. Donald F. Collins, father of Maine’s senior senator and a fixture of the Pine Tree State’s political scene in his own right, died Saturday night. He was 92. Collins, a Republican from Caribou, served five terms in the Maine House and Senate between 1970 and 1992, and as the mayor of the city of Caribou. He is survived by his wife of 70 years, Patricia Collins, and their six children, including U.S. Sen. Susan Collins. Politics was a family business. His older brother Samuel W. Collins Jr., a Harvard educated lawyer, represented Knox County in the Maine Senate from 1972 to 1984 and sat on the Maine Supreme Judicial Court from 1988 to 1994, according to BDN archives. The two Collins brothers even shared an apartment during the week while serving in Augusta, according to the Free Press. On Sunday, Maine’s political elite expressed sadness at the passing of a man they cast as a model of civic devotion and public service. Former Republican U.S. Sen. Olympia Snowe and her husband, former Republican Maine Gov. John McKernan Jr., both friends of the Collins family, in a statement Sunday praised Donald Collins for the “selfless devotion, passionate commitment, and dedication of service” he demonstrated during his time in the Maine Legislature. “We have such fond memories of Don over the years and have been great admirers of his, as well, since our first days working with him during his terms in the Maine State Senate,” Snowe and McKernan said. Collins was born in Caribou on Nov. 30, 1925. He was one of four brothers — Samuel Jr., Donald, Doug and David — born into the Collins family, according to the Free Press. His father, Samuel W. Collins, ran the family lumber business, S.W. Collins Co. in Caribou, an enterprise started by Donald’s great-grandfather Samuel Collins in 1844. Donald Collins served as member of the 87th Infantry in Europe during World War II, according to the BDN archives. 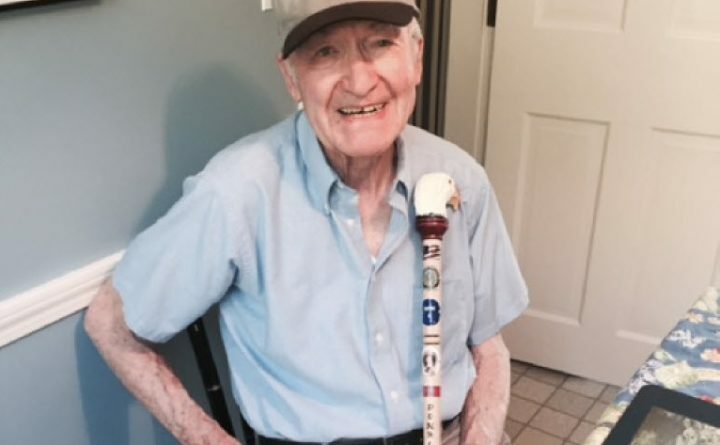 When he was only 19, he was wounded during the Battle of the Bulge, the last major German counteroffensive as the allied armies closed in on Berlin, for which he earned two Purple Hearts. He also was awarded a Combat Infantryman Badge, a Bronze Star and a Purple Heart with Oak Leaf Cluster, according to the BDN archives. Collins was discharged as a sergeant in January 1946, and he returned to Maine, where he enrolled at the University of Maine on the G.I. Bill. It was while at UMaine that he met his future wife, Patricia, according to the BDN archives. On March 2, MSNBC’s “Meet the Press Daily” host Chuck Todd congratulated Sen. Collins’ parents on celebrating their 70th wedding anniversary on Feb. 28. Donald Collins joined the family business in 1949, becoming the fourth generation to take the helm of S.W. Collins Co., and he was credited with helping the business to expand its operations, according to the Free Press. Collins retired in 1992, according to NBC affiliate WCSH. He racked up many honors, according to the TV station, including Caribou’s citizen of the year in 1975, the Maine Chamber of Commerce and Industry’s Business Leader of the Year in 1987, and was inducted into the Northern Maine Construction Hall of Fame in 2009. BDN writer Jake Bleiberg contributed to this report.